The sacred site of Mihintale has immense significance in the narrative of Buddhism in Sri Lanka. It was here in the 2nd Century BCE that the Indian emperor Ashoka’s son Mihinda is thought to have taught Buddhist dhamma to King Devanampiyatissa, the ruling Sinhalese monarch. After many years of reading about Mihintale and visiting nearby sites I finally had a chance to make my own first pilgrimage with my family. Mihintale lies within sight and only 8 kilometers east of the massive dagobas and ruins of historic Anuradhapura. It sits on and amongst a boulder-studded, forest-encased hillock. From a distance the gleaming white dagobas- especially the large Mahaseya – are visible emerging from the canopy. The forest is dry mixed evergreen and is a reason in itself to take the time to visit the area. The architecture of the sacred sites is infused amongst the caves, boulders and forests of the hills. We had journeyed up Sri Lanka’s west coast on a mid term break looking to explore coastal sites, Wilpattu’s protected areas and then some of the sacred sites in the northern part of the Cultural Triangle. The pictures from this post highlight some of the sublime sites in both Mihintale and Anuradhapura. 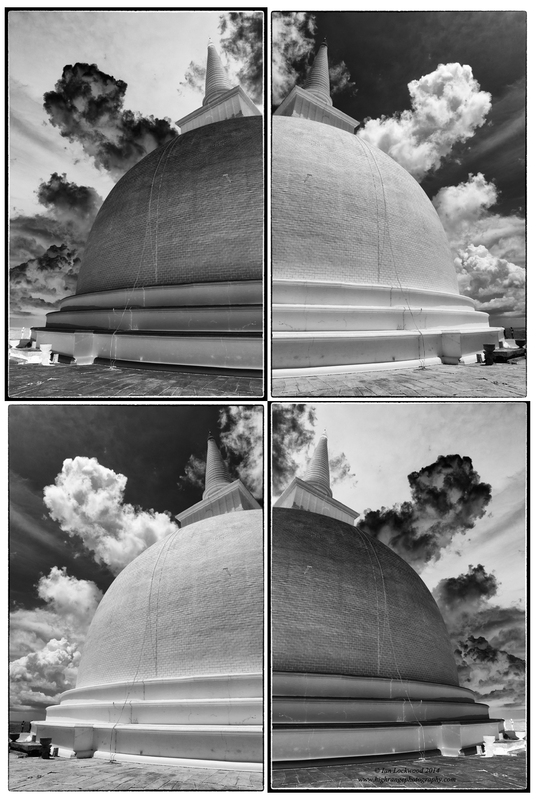 As with most of my work these days, they were shot digitally and then processed into black & white back at home. 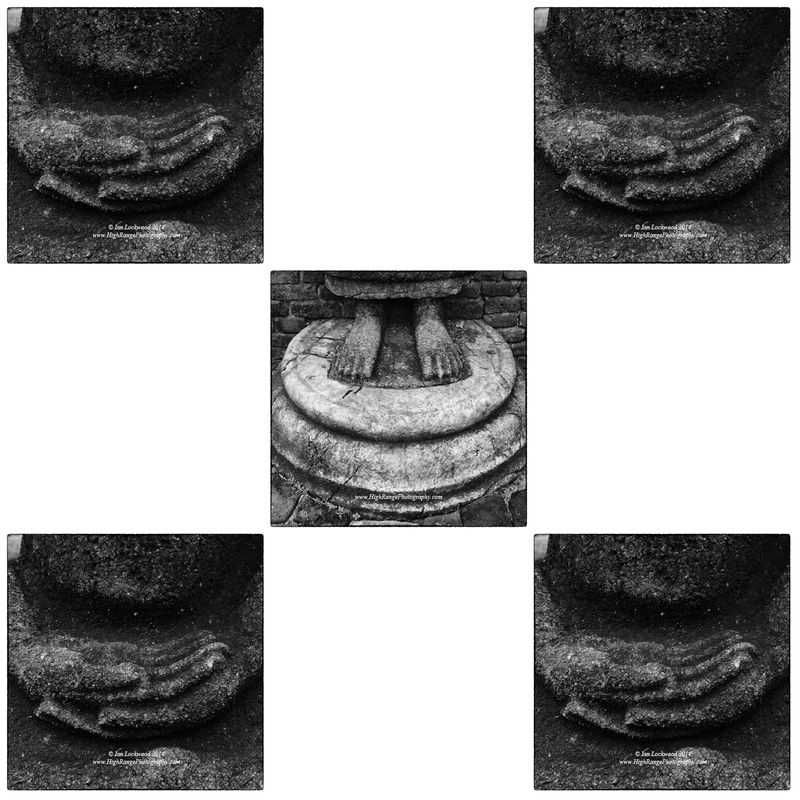 They join a growing body of work on sacred spaces in Sri Lanka and southern India that I am working to prepare for exhibition. 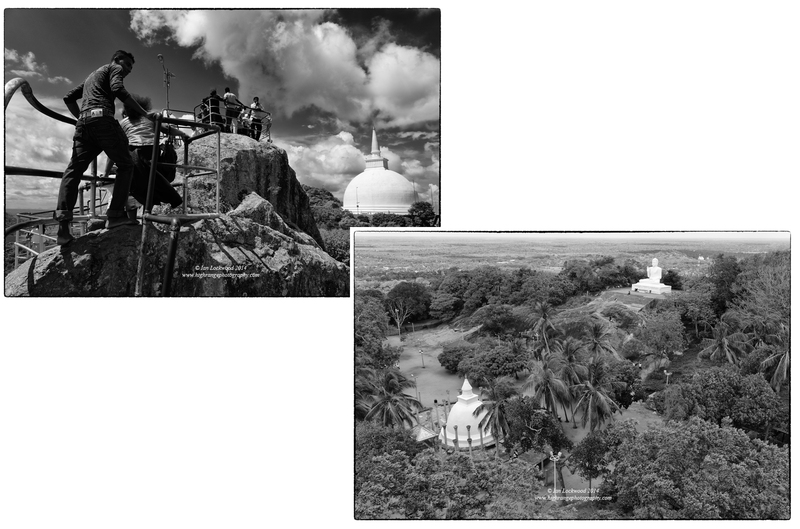 Scenes of and from Aradhana Gala (Invitation Rock) where Mahinda preached his first sermon. Aradhana Gala looking south. Ritigala is the distant hill in the clouds (to the south-east) in the left corner. Mahaseya Dagoba study in positive and negative. Thuparama and Jetavana Dagobas in Anuradhapura. 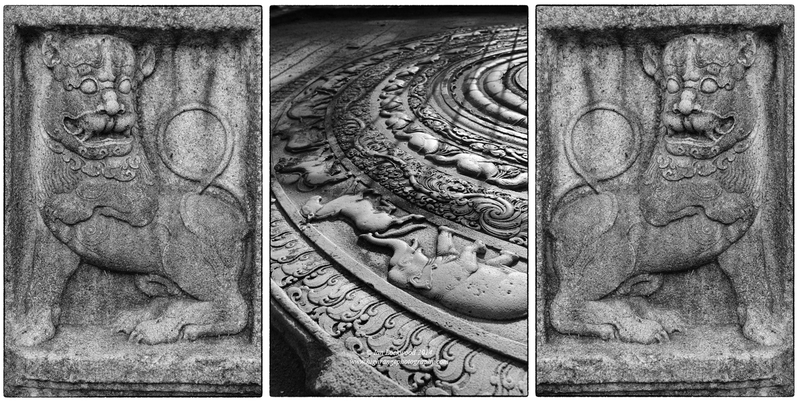 Abhayagiri moonstone details and neighboring lion guard stone. 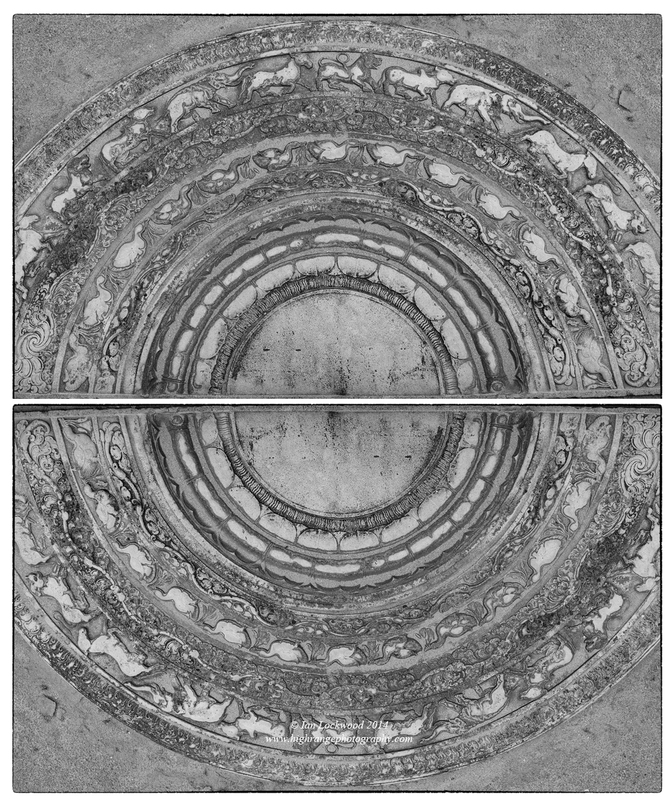 Mirror study of the Abhayagiri moonstone. Dhammika, Ven S. “Mihintale.” Sacred Island: A Buddhist Pilgrim’s Guide to Sri Lanka. 2004. Web. October 2014. Fernando, Nihal et al. 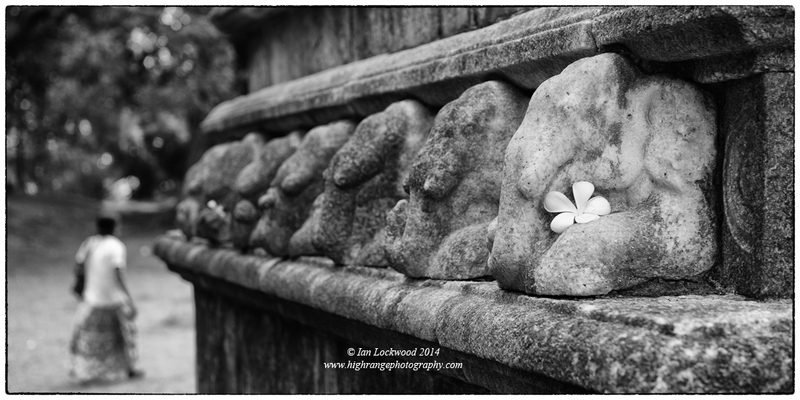 Stones of Eloquence: The Lithic Saga of Sri Lanka. Colombo: Studio Times, 2008. Print. This book encapsulates the lithic saga of the island…a wonderful resource and especially as we stayed at the principal author’s son’s Back of Beyond guesthouse in Anuradhapura. Hanh, Thich Nhat. Old Path White Clouds. New Delhi: Full Circle, 1991. Print. A classic retelling of the Buddha’s life that helps one understand the threads of the teaching in the historical sites of Sri Lanka. Three Blind Men. Sri Lanka – Mihintale & Kaludiya Pokuna. Web. 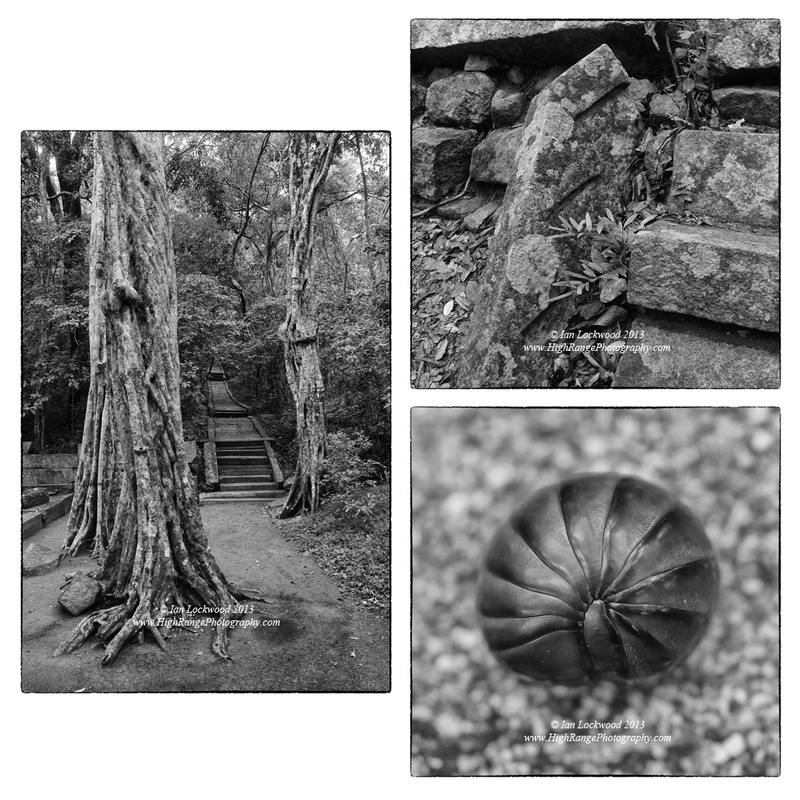 Check out these stunning photographs and albums of the area by my friends Dominic Sansoni and Sebastian Posingis. Mahesh Murti (Trimurti) in Elephanta: a sublime and colossal example of6th-8th Century Hindu cave architecture in western India. Taken with a Canon G12 and edited with Photoshop Plugins from Nik Software. In the last week of February I had the opportunity to participate in the bi-annual ASB Unplugged, a series of technology-oriented workshops and talks aimed at international educators. The visits to Mumbai, after a long nine-year gap, offered a chance to reconnect with cultural aspects of the Sahyadris (northern Western Ghats) and explore paradigm shifts in the way we use technology in schools. Before the conference began one of my Sri Lankan colleagues and I took a day trip into the city to revisit Elephanta Island. This is a special, albeit popular, place that most good tourists visiting Mumbai see. 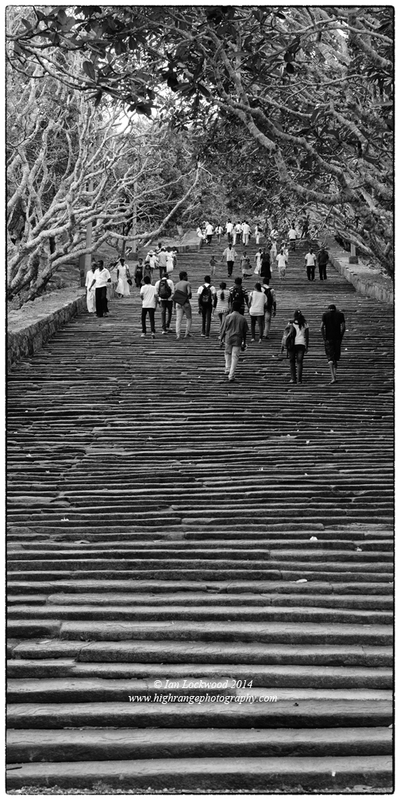 I got to know Elephanta in 2001 when I spent a month in Mumbai exhibiting my Western Ghats Portrait and Panorama exhibition. These 6th Century temples are some of the most exquisite examples of cave-excavated sacred spaces and are on par with the more extensive Ajanta and Elora caves in central Maharashtra. 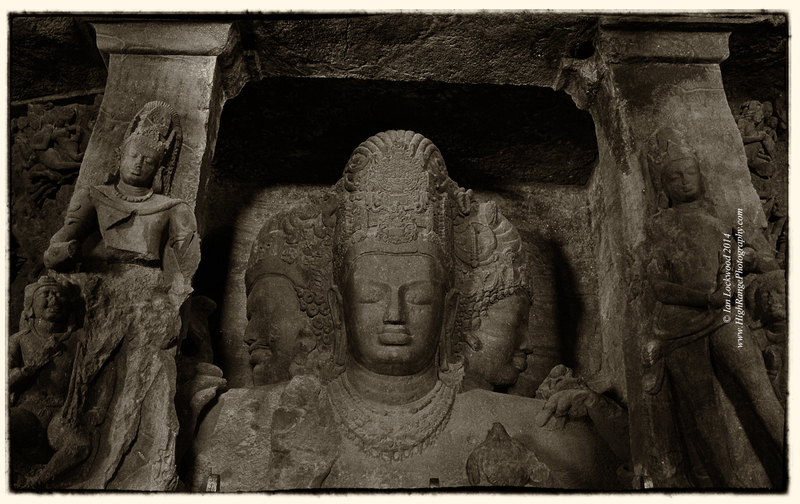 The Elephanta cave temples are mostly dedicated to Shiva and are of the Gupta-Chalukyan art style (Harle 124). I’ve been intrigued with these cave temples and others in the nearby hills near Lonavala and Pune because of their cultural connection to the physical geography of the Western Ghats. The rock that the temples are cut from is basalt, associated with the Deccan Traps (see H.C Sheth’s scholarly article link below for a fascinating exploration of volcanism in the Deccan). Their estimated date of roughly 65 million years makes them relatively young when compared to the pre-Cambrian horsts of the Southern Western Ghats ranges. The caves are set into a wooded hillside that overlooks Bombay harbor (see linked Landsat map in next post for location). Being caves with deep recesses they have subdued, exquisite lighting conditions that help create an ethereal experience for pilgrims and visitors. For photographers it is a challenge to do justice to the interior spaces and carvings without using artificial lighting. 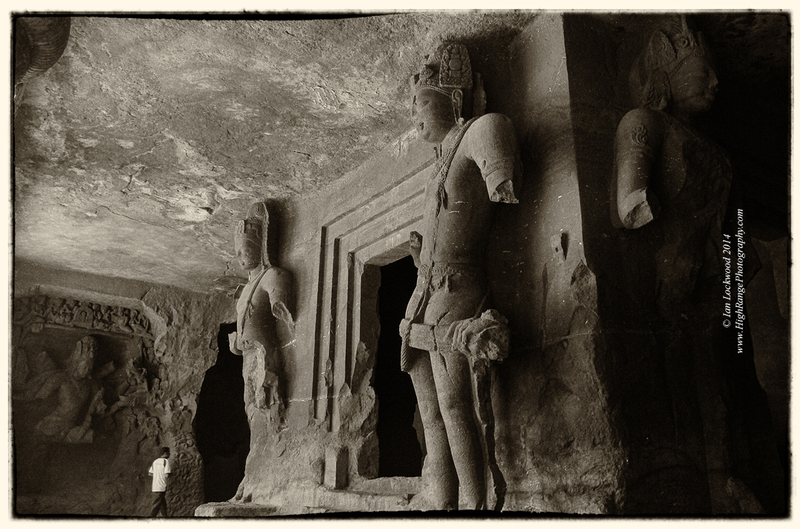 On my visit in 2001 I had used a Mamiya 6 medium format 6cm x 6cm film camera to try to document the Elephanta caves. Remembering back, it was a somewhat frustrating photographic experience since I had not been allowed to use my tripod by the ever-vigilant Archeological Survey of India guards. Thus I was forced to shoot hand held using a strobe to light up the deities. This time, I was travelling light and armed only with a small Cannon G12. The versatility of digital cameras is something that I appreciate though I really would like to return with a tripod and higher end DSLR. The pictures here are the result of the latest hand held experiments using the G12. 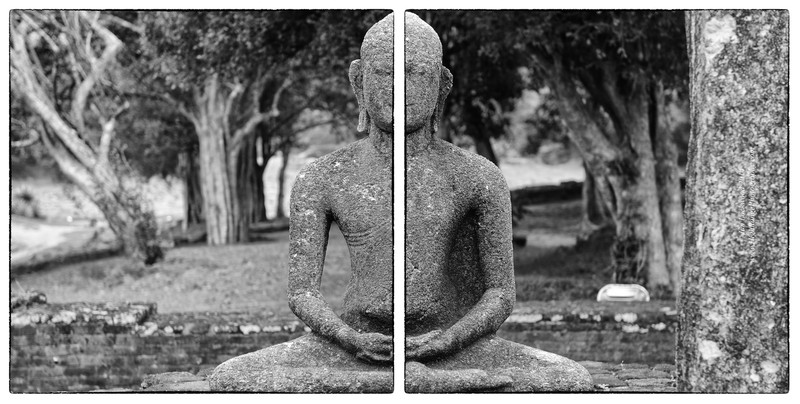 Mahesh Murti composite panoramic image. 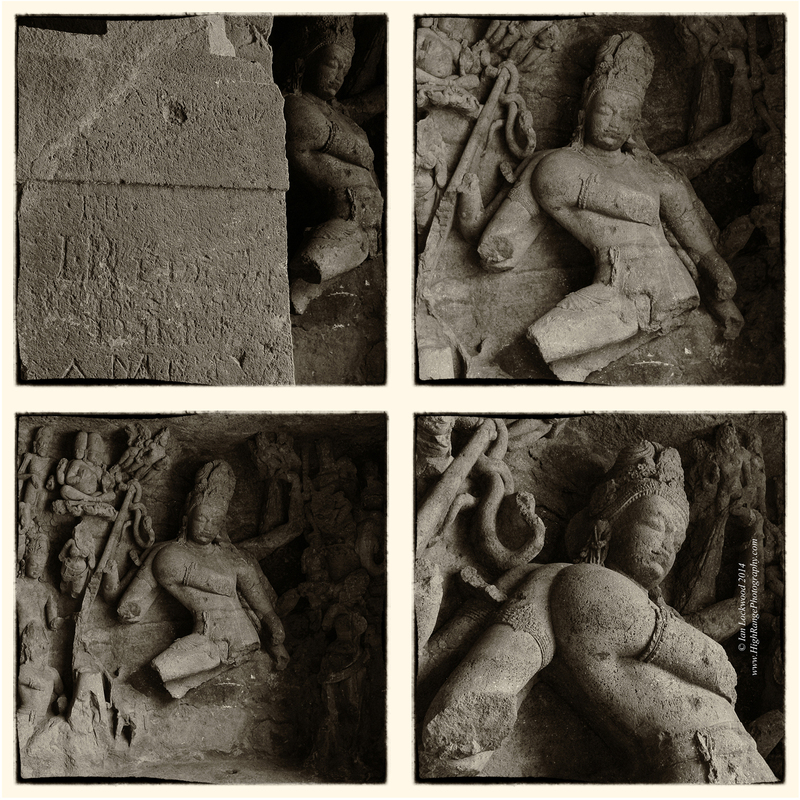 Nagaraja at west entrance to Elephanta caves…a series of view including one showing Portuguese (?) graffiti from the distant past. Dvarapalas (guard figures) at Elephanta with Siva (Andhakasura Vadh) in the back left. Harle, J.C. The Art & Architecture of the Indian Subcontinent. London: Penguin, 1986. Print. Sheth, H.C. “Plume-related regional pre-volcanic uplift in the Deccan Traps: Absence of evidence, evidence of absence.” MantlePlumes. August 2006. Web and PDF. 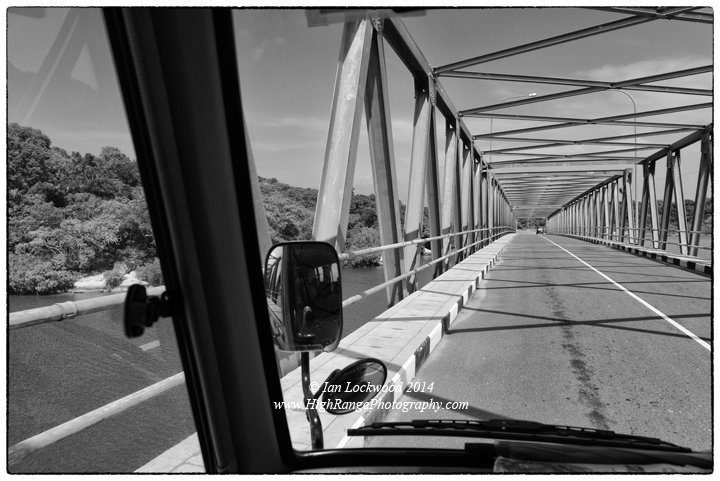 Sahyadris: A Photographic Gallery. See High Range Photography. 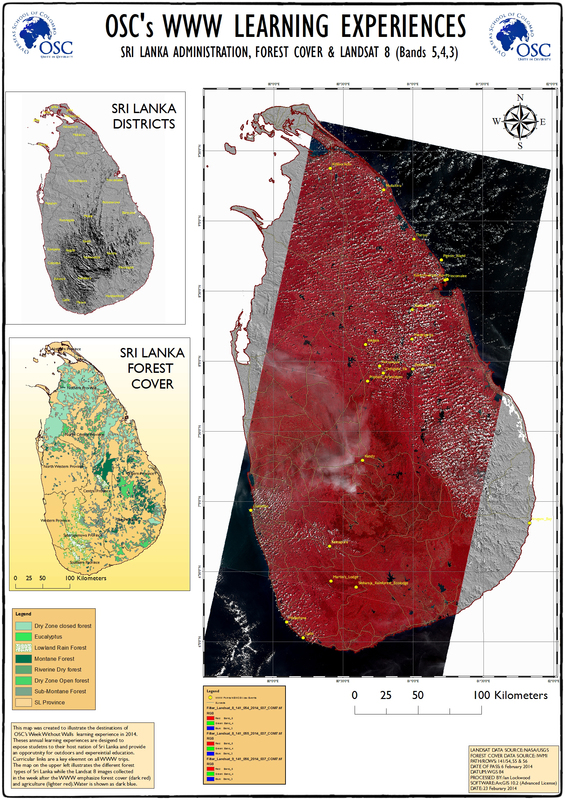 During the Week Without Walls trip that was highlighted and mapped in the previous post our small group explored the rich links between historical sites and their dry zone ecology in the central and north-eastern part of Sri Lanka. Notably we spent time at the Ritigala Hermitage (now part of the Ritigala Strict Nature Reserve), Medirigiriya, Thiriyai and Pidruangala. All of these sites have important historical links but, either through design or the passage of time, have fused together with their natural surroundings. The vegetation of Sri Lanka’s Dry Zone is categorized by the World Wide Fund for Nature (WWF) as “Sri Lanka Dry Zone Evergreen Forest” (code IM0212). In its undisturbed examples it is composed of dense thicket of trees, shrubs and lianas adapted to a long season of no rain with a short period of rain during the North-East monsoon. 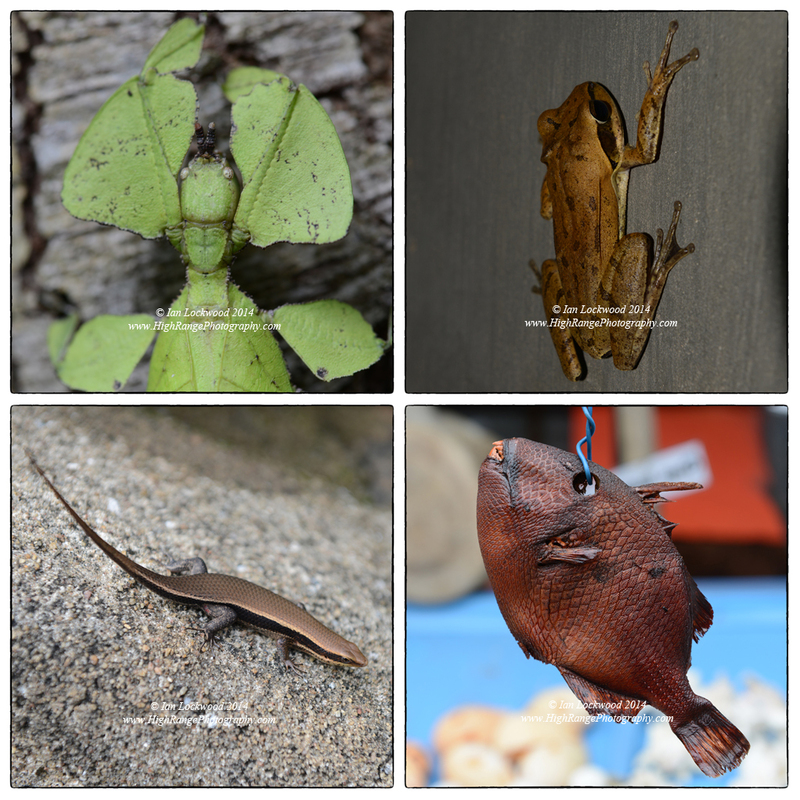 The canopy height is never as high as the evergreen rainforests found in the wet zone but I have been awed by the numerous examples of large dry-zone species that we encountered. 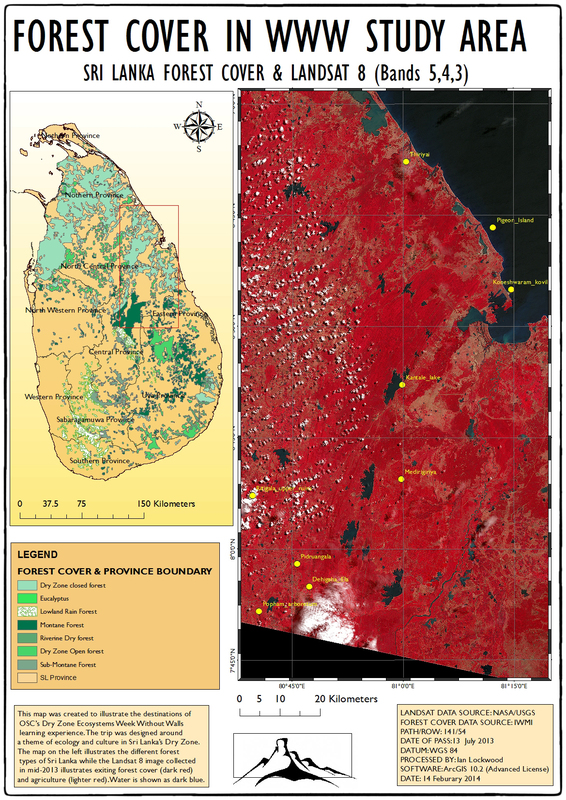 Sri Lanka’s dry zone has interesting similarities to the dry forest eco-region of the area to the east of the southern Western Ghats (code IM0204). Our group had an introduction to this eco-region with a night walk at the Popham Arboreum on our first night. We encountered a gray slender loris (Loris lydekkerianus), several sleeping birds and later a large Indian rock python (Python molurus) crossing the road. The group walked -not exactly soundlessly- amongst the regenerated forest that is now a living example of what ecological restoration can achieve in the eco-region. I would definitely like to bring another group of ecologists back for a daytime visit and study. In the subsequent days we visited the archeological sites in the Sigiriya-Trinco area. This is what makes up the series of images in this post. 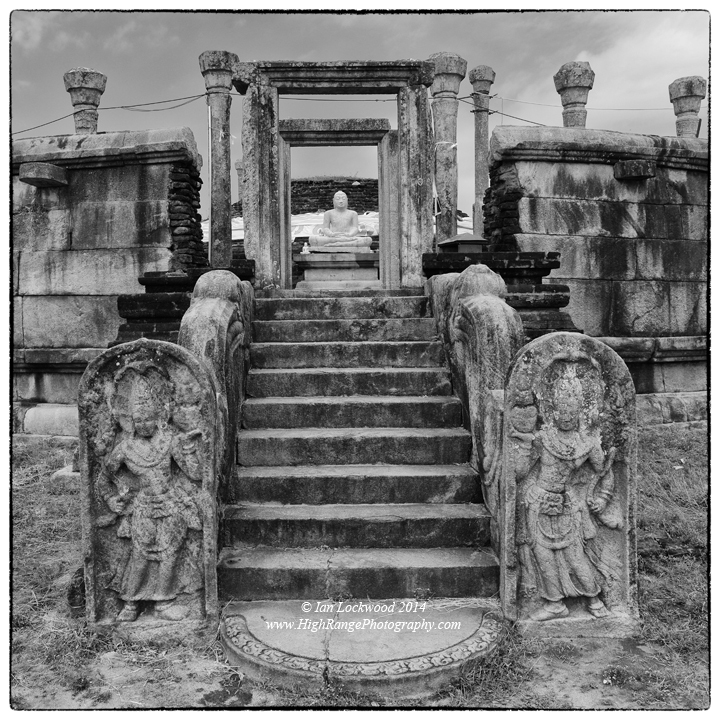 For what is surely the best visual overview of Sri Lanka’s archeological treasures, Studio Times’ Stones of Eloquence is a must-have resource. It has chapters on all of the significant historical sites in Sri Lanka with a focus on the country’s rich Buddhist history. The book was produced by Studio Times in 2008 with major contribution for Nihal Fernando, Anu Weeriyasuiya, Christopher Silva and others. The connection between these authors and Back of Beyond is not a coincidence and many of our site choices on this Week Without Walls were inspired by this publication. 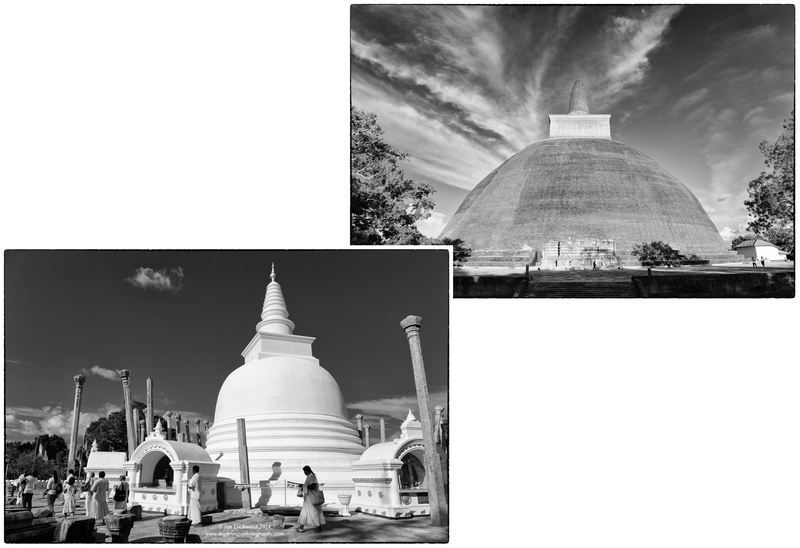 Nihal Fernando is one of Sri Lanka’s preeminent photographer and his use of Black & White imagery to present these sacred sites is inspirational. 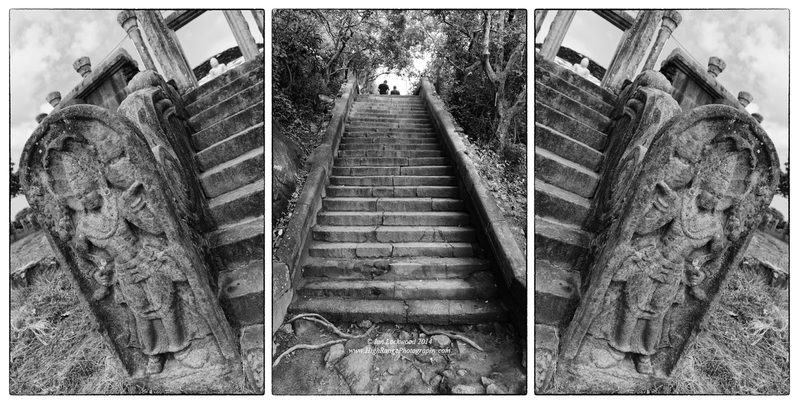 Steps & guardstones at Thiriyai… a collection of angles and views. New bridge near Thiriyai (looking south). Road access to many areas in the north and east has been significantly improved in the years after the Tsunami and end of the conflict. Steps amidst dry evergreen forest at Thiriyai. This is a sublime, little visited Buddhist sanctuary with interesting historical links to the Tamil communities that live in the area. Seated Buddha amidst forest and gardens at Medirigiriya. Medirigiriya Vatadage from the west. Amongst the many stories and tradition of South Asia, no myth pervades the imagination in quite the way that the Ramayana does. This epic tale of heroes, villains, deceit and loyalty is set amongst an ancient India that encompasses much of the subcontinent’s diverse physical geography. The epic is more than a series of stories and subplots with complex characters and is also regarded as scripture by many devout Hindus. Its popularity spread where ancient Indians traded and today the Ramayana is still an important cultural element in South East Asia as well as locations that Indians migrated to during the colonial and modern period. Here in Sri Lanka, the island is remembered as “Lanka” the home of the demon king Ravana and a setting for numerous events in the Ramayana chronicle. I was first exposed to the Ramayana to it in my early high school years when we read the entire book as part of Sally Noorullah’s brilliant South Asian Studies (SAS) class at AIS/Dhaka. At the that time, it was the hero’s tale that gripped my imagination. In more recent years I have become intrigued with the fascinating links between the Ramayana story and the linked biogeography of Sri Lanka, the Western Ghats and the Himalaya. In the epic tradition, towards the end of the story Laxamana, the brother of Rama, is gravely injured in a battle with Ravana. Rama asks Hanuman to fly to the Himalaya’s to gather and retrieve sanjavani, a life-giving medicinal herb that will cure Laxamana. Blessed with special flight powers, Hanuman leaps across peninsular India’s vast forested lowlands and river valleys to find the magic mountain in the mighty, snow-capped Himalaya. He successfully finds the mountain but is mystified by the abundance of different plants growing on it. So, in an ingenious master stoke that only a monkey god can perform, he carries the whole mountain southwards. Hanuman arrives in time and Laxamana is cured. The battle is won, a complex series of plots is drawn to a close, Sita is reunited with Rama and good triumphs over evil. A lesser-known part of the story is that as Hanuman flew southwards bits and pieces of the mountain are believed to have fallen off. Today, there are dozens of sacred groves and forests hillock along the Western Ghats and in Sri Lanka that host sites where these chunks of “Hanuman’s mountain” were reported to have fallen to earth. They host vegetation and life forms with a unique Himalayan affiliation, which is where the myth and biogeography come together. 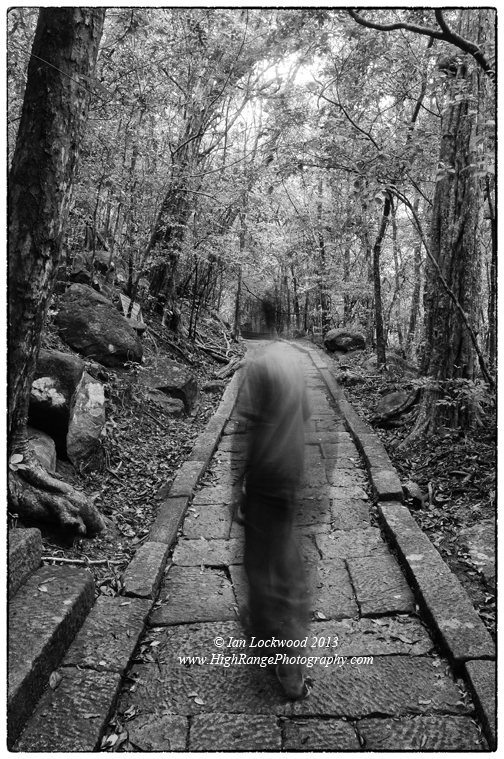 Sri Lanka hosts several scared groves with mythical links to Hanuman and his amazing flight to the Himalaya and back. 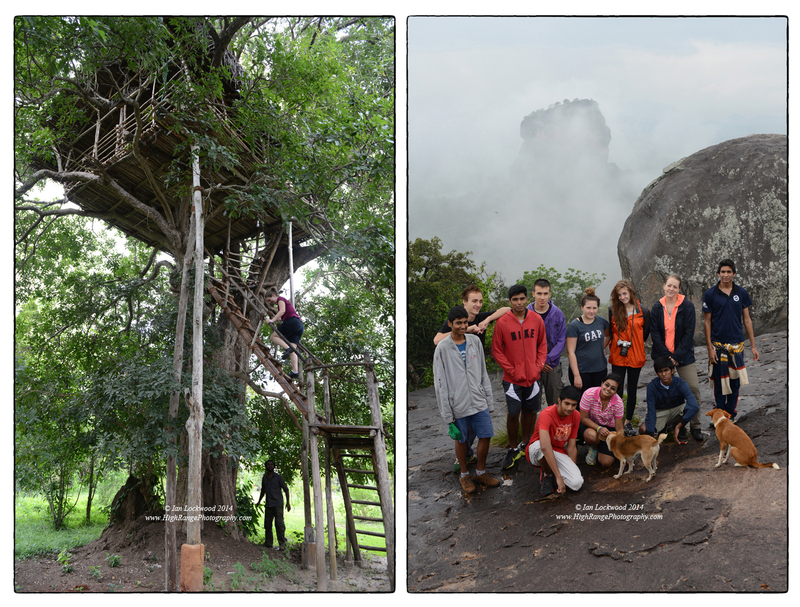 The remote forest monastery of Ritigala, just north of Sigiriya, is one of the important sites. In fact it is believed that an exposed boulder that crowns Ritigala’s densely forested slopes is where Hanuman leapt away on the start of his flight to the Himalaya. Ritigala is composed of an assemblage of mountains that rise above the plains and host a small but significant patch of forest. Although it is located in the “dry zone” of Sri Lanka the mountain has its own microclimate and there are a variety of vegetation types on it. In the coming months I am preparing a learning experience for OSC students that will explore the dry zone forests and marine systems of the east coast. One of our days will be spent exploring Ritigala. In order to get a better sense of the area and make plans for our upcoming trip my family and I had a chance to visit Ritigala earlier this month. The pictures in the post were mostly taken on this trip. Hanuman carrying the mountain of medicinal herbs from the Himalayas to the shores of Lanka to help cure the gravely injured brother of Rama, Laxaman. This is a popular scene painted on transport vehicles and walls across India. 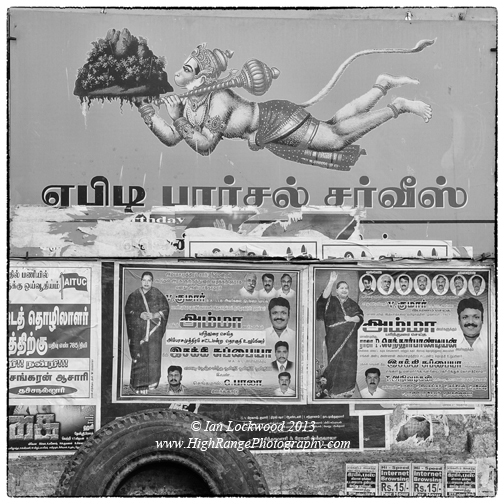 This image was taken on the Tamil Nadu plains near Tirunelveli in 2010. Ritigala seen from the south east approach. The upper areas are a “strict nature reserve” and are out of bounds for visitors. Ritigala pathway, step detail and poochi. 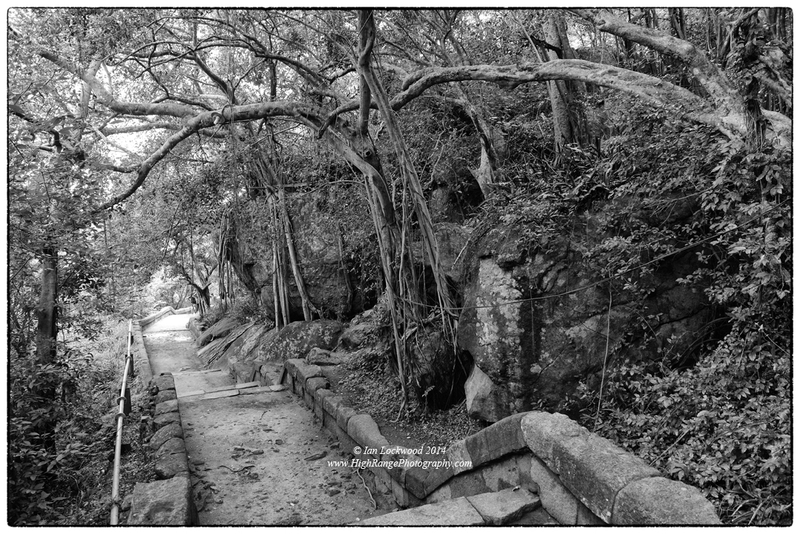 More Ritigala images: a mix of crumbling granite steps taken over by the forest, the “library”-certainly our favorite place- and a sign warning visitors of elephants in the area (both wild and from a nearby elephant orphanage). 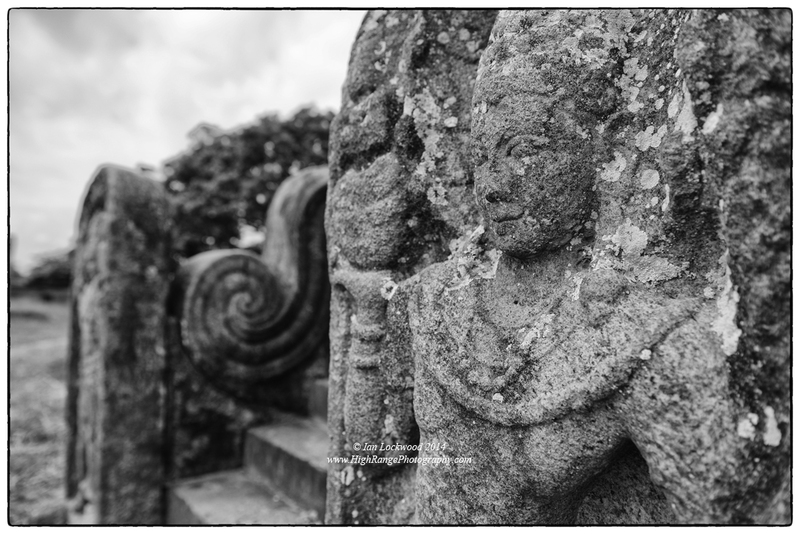 See Sebastian Posingis’ 2011 blog post for sublime images depicting Ritigala. Thelka has just published a book excerpt and article by Devdutt Pattanaik on his writing of the Ramayana. “The unique mountain ranges in Sri Lanka.” Sunday Times. 8 January 2012. Web. 28 October 2013. Wijesekera, Lawanya. “Ritigala, evergreen misty mountain once an austere Buddhist monastery.” Sunday Times. 13 November 2011. Web. 28 October 2013.